Disclaimer:- This story is not meant to be taken seriously but as a light hearted little anecdote which I found amusing and felt compelled to share with you. While walking with a friend lets call her Liz (you know the one who owes me a lunch from (Day 152) we were talking about philosophical things as usual and out of nowhere she asked me a rather strange question. Well let me tell you, I made sure I checked left and right more than once every time we crossed the road after that especially because I knew I was going to be making her walk up a couple more hills before we could start out return journey home. I was particularly looking out for that bus she was talking about, not because I believed any of her mumbo jumbo but because I thought she might just push me out in front of it. I made sure to tell her that is wasn’t afraid to die and at least my family would have an easier job of sorting out my personal effects if by some “strange coincidence” such a thing should happen. As I said in my disclaimer this is just a little anecdote that amused me but that being said it does raise a serious fact to consider and that is if you don’t get your clutter under control someone else is going to be stuck with the task when you are gone and you never know when that might happen. It is enough to bare the grief of someone’s passing without having to make awkward decisions about what should happen to the personal effects they leave behind. 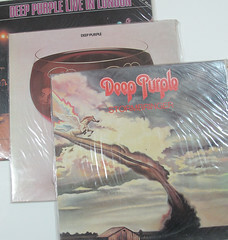 My hubby is working on digitising his record collection and then selling the old records on ebay. These three fetched $6.80 I might add that once again we used recycled cardboard to make the packaging for mailing these items. Oddly enough, an accident happening is a major reason why I want to declutter. I don’t want my husband or family members to have to go through junk to see what is worth keeping (either to sell or to pass on to someone else). any reason is a good reason but that one is a selfless one. Good for you. Having just gone through the processes of emptying my mother’s house in preparation for sale, I am even MORE adamant that I won’t put my kids through the same thing. My sister and I would beg Mum (who is now in a nursing home) to let us go through her stuff and help her declutter as she was a pack rat and never threw anything out. She always replied that “I’ll leave you that pleasure for when I am dead”. It did NOT make me happy at all! Hi Loretta & Willow it sure doesn’t sound like fun to me either. I haven’t had that to deal with but I am sure my day will come. I am determined it won’t be me doing it to someone else though. Oh how well I understand this! My parents cleaned out two parents’ homes in four months. After that, they went home and decluttered their house so we wouldn’t have to go through what they had. How I appreciated their foresight and thoughtfulness! I hope to pass on the blessing to my children. And as for your friend–two more hills tomorrow! Well, if you’re REALLY superstitious, the decluttering acts like a spell to ward off accidents. Kind of like when mothers would tell their kids to be sure to wear clean underwear in case you had to be taken to a hospital! I suppose that is a different take on the situation. I will run that one past Liz and see what she thinks. I did go walking with her again on Friday and she still didn’t push me out in front of a bus so maybe she was just being superstitious after all. The reason I started ruthlessly decluttering was two-fold. Some friends had just moved and I had helped. I just could not believe how much work and how many vehicles it took to transplant them to a new state. A few years ago a friend had been killed in an accident and had left a houseful of stuff. My mom is a hoarder and I can’t even begin to imagine going through her house after she’s gone. I did not want to either move my stuff or die and leave my things for someone else to go through. So here I am minimalizing as much as I feel comfortable. I had a garage sale last weekend, but even now I am starting to collect unwanted items in boxes again. I’ll have to have a fall sale. I really only touched on this subject with this post but it seems to have evoked some interesting responses from people who have been subjected to the unfortunate possition of dealing with lost loved ones clutter. When I started to write this post my intension was just to convey an amusing little anecdote and keep the post light and amusing for a change. By the time I got to the end of my story I started to see how uncomfortable this situation can be for people hense the rather serious ending to the post. I think I may devote a page to this subject in the next couple of days. Stay tuned. Funnily enough, this was what sort of started me off – initially, not being so good on ladders now, I started clearing/thinning out-of-reach storage; then thought of the job my (only) daughter would have to face, if I don’t! Now, it seems to have taken off. this is as good a reason as any to declutter. You just never know when your number will be up and like I said in this post the event can be tragic enough without those left behind having to sift through years and years of clutter. I am glad that your starting point has escalated to a full blown declutter mission. Once you feel the burdon of all that unloved stuff lifting off your shoulders the freedom can go to your head. Enjoy the freedom. Trouble was: it wasn’t unloved – much of it still isn’t – there’s just such a lot of it! That certainly adds another degree of difficulty. All you can do in that case I suppose is let your practical side overrule your sentimental side. The forces can be strong in both so that isn’t easy. Good for you to be able to make the hard decisions. We dug my Grandparents out of their house of 40 years, and boy was it a project. At the end, we had an 8 hour auction that was going a mile a minute the whole time — with just the stuff from their property. And the really absurd thing? We found items that had been packed for the move to that house and had never been taken out of the box and the (40 year old) newspapers they had been packed in. Talk about a waste, to pack all that stuff up and go to the trouble of moving it and then never use it or enjoy it! The old newspaper was fascinating, though. There was an ad about how maybe YOU need a checkbook. (It’s just like cash — only more convenient!) It was hilarious. how did your grandparents adjust to the change. I bet it seem strange to them at first but them a huge relief. I can imagine it was hilarious reading those newspapers. How things have changed in 40 years. They were incapable of doing any of the decluttering themselves (they were hoarders), so we eventually gave up even allowing Granny to “help,” because she couldn’t actually get rid of anything. In the end, we had to be the ones to pick what they kept and what they didn’t because they weren’t capable of making those decisions themselves. Sad, I know. That is sad Allison, I am so glad I am never going to be like that. It must have been so hard for them and for you to have to take charge. I am so glad my mother is finally starting to convince my dad that he can no longer take care of their home and are seriously considering downsizing to a retirement village where all the outside work is taken care of and where there is company should one of them be left on their own. I must let them know that I would be happy to come up and help them with the moving process. Up until now I have just been gently encouraging them to take the plunge. My MIL moved to the nursing home from my SIL’s. Later she was hospitalized several times. When we visited we stayed with my SIL. I had time on my hands and knowing my MIL was pretty much a pack rat and that every item needed to be gone through, I told my SIL I would declutter for her if she wanted me to, and if MIL got upset on an unlikely visit to just blame it on me. So I did this, knowing I probably would not be able to help out when her mother died (and that it would be more emotional for her at that time). It was a real jumble with junk mail, etc. mixed in with jewelry, family news clipping (obits, etc. )–of interest to SIL for her genealogy hobby. Loose coins, jewelry, etc. were put together in one place, and other items sorted the same way. As far as clothing went, only worn out items were discarded–all others no matter how out of date were left. But like items were put together. A lot of stuff was thrown out, even some empty boxes. So, yes, keeping our homes as decluttered as possible will be a blessing to our children, whether we are hit by a bus, or simply go of old age. We will all leave some stuff behind no matter what.